Gateshead Then & Now Out Now!! Gateshead Then & Now is now available in all good bookshops and online! Find out more on my books page, and head on over to Amazon if you want to order a copy. Wallsend Then & Now OUT NOW!! Wallsend Then & Now, is out now! Check out more details about the book on my books page, and to buy a copy at Amazon just click here. Bargain Books Flying off the Shelves! 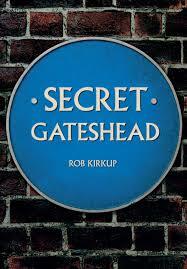 Amazon are selling Kindle versions of my books Ghostly Tyne and Wear and Ghostly County Durham for only £1.79 each. They usually retail for £12.99 each so grab these books now before the price goes back up. On the evening of Thursday the 13th February a monumental meeting took place at TGI Fridays in Gateshead. I was joined by Tom, Rich, and John, and over a delicious burger and bottomless drinks I explained my thoughts for a book to follow Ghosts of York and Ghosts of Edinburgh, to complete what has become known as the 'Spooks and Hog Roast Trilogy'. The guys all signed up there and then to Ghosts of the North East which will follow us as we go in search of the paranormal in our own back yard. It's been a few months now since the release of Ghosts of Edinburgh and I've decided to let you into a a little secret. There's an 'Easter egg' contained with in those crisp, paranormal-packed pages. GOTNE Appear on the Crash Course in Awesome Podcast Again! 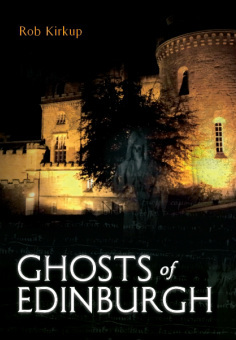 Ghosts of Edinburgh OUT NOW!!! After over a year of organising, ghost hunting, and countless hours of writing; Ghosts of Edinburgh is now on sale and with the night's drawing in, and the weather turning colder, Halloween is almost here. What better way to spend the spookiest night of the year than reading about some seriously terrifying encounters, in some of the scariest places, in one of the world's most haunted cities? Our epic adventure comes in at over 60,000 words, with 60 photos, and chapters with titles as intriguing as The Science of the Lambs, Saturday Night's Alright for Frightening, and Don't Lick the Wallpaper, Ghosts of Edinburgh will guarantee laughs and scares galore. 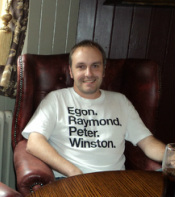 I'm Rob Kirkup and welcome to my website, Ghosts of the North East, one of the longest running paranormal groups in the north east. Follow my regular foray into the world of the paranormal, as well as my magazine articles and books on the subject. I designed the first incarnation of this site in 2002 after my first ever paranormal investigation in the dead of night on the 31st October that year, when I led three friends into the creepy wilderness of Talkin Tarn as part of the Halloween show on Metro Radio's Alan Robson's Night Owls. However, ten years, dozens of radio and newspaper interviews, and almost 1,000,000 visitors to the site later I could have never have even began to imagine where my passion for the unexplainable would take me. In 2003 a large American paranormal society contacted me asking if I'd be the Chief Executive for their North of England branch. I turned this kind offer down and also declined a string of invitations to join local teams, choosing to stay true to my roots; my first ever investigation was with a few close friends, and although the personnel has changed over the years the current team is made up of my younger brother Tom, and two good friends; John 'the Monster' Crozier and Rich Stokoe. I signed a contract with the History Press in the summer of 2007 to write my first book, and in 2008 I was overjoyed to see Ghostly Northumberland go on sale. I have since had four other books published by the History Press; Ghostly Tyne & Wear, Ghostly County Durham, Ghostly Cumbria, and Newcastle Then & Now and I've contracts in place to write a further two books with them. The site may be called Ghosts of the North East but in May 2010 I had an idea - I wanted to take the team on the road and tackle some of the most haunted cities in the UK. I contacted a different publisher about this and within a couple of weeks I'd signed a deal with Amberley Publishing to write two books: Ghosts of York, published in August of 2012, and Ghosts of Edinburgh, published September 2013. Both books would see the team investigate some of the most active locations and I'd write a book very much in the style of the reports on this site. So turn off the lights, get comfortable and read some horrific stories about some of our regions most active locations and the ghosts said to haunt them. Find out what we will encounter as I visit these places in the dead of night, sometimes alone. Often hilarious, always terrifying. Let me take you on a journey to some of the most haunted places in our region.